Marijuana seeks to bring to the reader the whole configuration of this problem, which, like the Sexual Revolution and the New Politics, was at the heart of the alienation felt by many young people during the second half of the 1960s and the fears of social breakdown voiced by many of their elders. 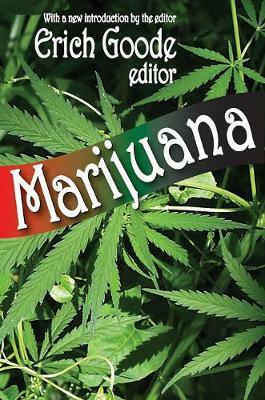 The book, first published in 1969, describes the history of marijuana use, how the drug was distributed in this country, the extent and patterns of its use by students and other groups, its possible connection with crime and drug addiction, and the widely differing arguments of its foes and supporters. It is replete with first-hand accounts by people who smoked and sold marijuana, as well as by those who studied the phenomenon from socio logical, psychiatric, legal, educational, and other viewpoints. Much of the work published on marijuana has dealt with its chemical, medical, pharmacological, and agricultural aspects. While these approaches are necessarily touched upon here, the focus of this still timely volume is sociological; it is the only anthology from the period to concentrate on this aspect, to present articles topically, and to deal with all points of view. The new introduction by the editor reviews contemporary uses of marijuana and discusses how attitudes about it have changes. Marijuana is a fascinating and informative book for everyone, and it is a particularly valuable addition to courses in introductory sociology, social problems, social deviance, disorganization, social pathology, and criminology.